Where: The beach, Virginia Beach to be exact. Who: Vacationers trying to enjoy the last official beach weekend of the summer. It’s a tradition. 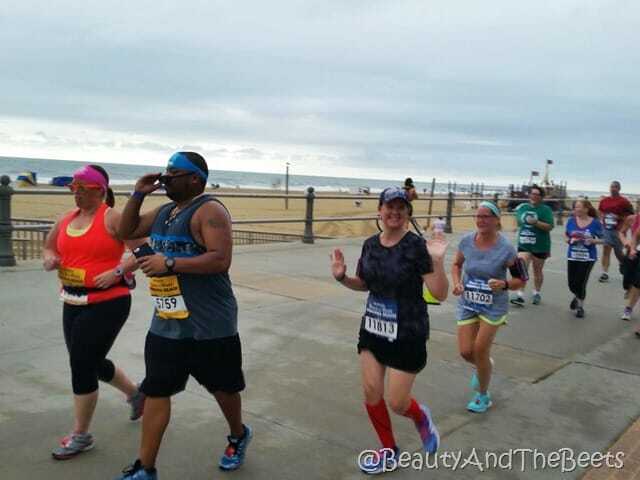 While families, young couples and old couples alike are flocking to the beach to soak up the last of the summer rays, there are thousands of people who have also gathered in the same town for an entirely different reason- the Humana Rock‘n’Roll Virginia Beach Half Marathon. I am one of those in the latter group. It’s my first race since my surgery last December and I am super excited, yet nervous. I am just hopeful that my foot will hold up and not be too painful and I can finish my race. I’ve actually committed to running two races this weekend. The first on Saturday is the Mile on the Sand, while race number two is the 5K on Sunday. While I am running three half marathons this fall, I didn’t want to push my foot with a half marathon, not yet. The first thing I did upon arriving into town Friday night was hit up the running and health expo at the Virginia Beach Convention Center. 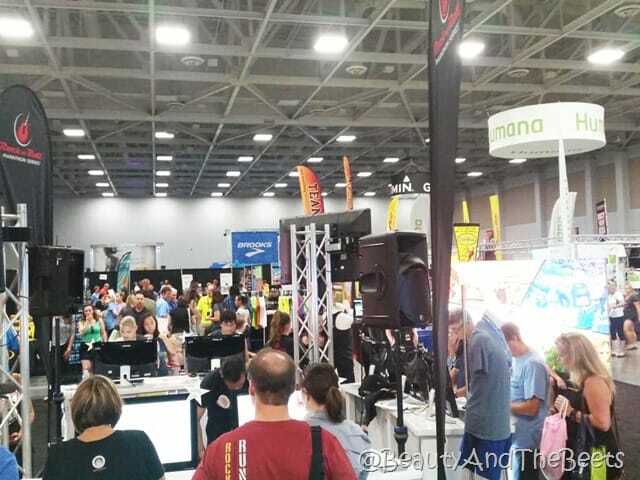 The expo is always a great place to peruse the latest running gear and gadgets, as well as a place to gather any last minute information for the weekend races. As Humana was my sponsor for this event, I made it a point to venture over to their booth, just to say hi. 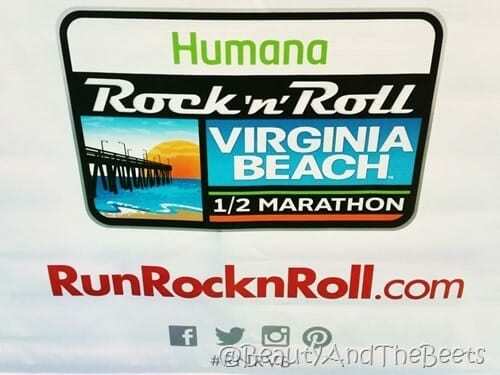 In addition to the Virginia Beach races, Humana is also the title sponsor of the marathon races in Chicago, San Antonio and New Orleans as well as the sponsor of the Tune Up for Rock ‘n’ Roll 5K races in Atlanta, Baton Rouge and Knoxville. Two thousand people gathered on the beach at 19th Street Saturday morning for the Mile on the Sand run. 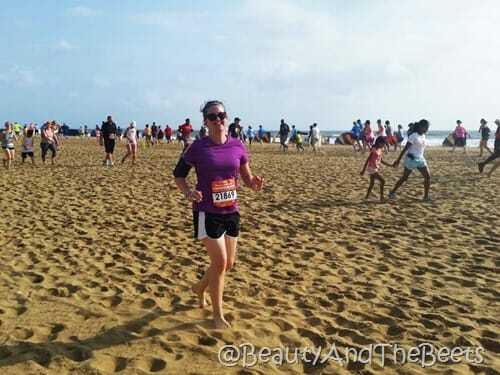 After reading about other runners’ experiences at this race, I decided to run barefoot as to avoid having sandy running shoes. But first- as I was soaking my toes just at the cusp of the ocean, I ran into Derek Mitchell, who was also participating in the weekend festivities. If you don’t know who Derek Mitchell is allow me to enlighten you. 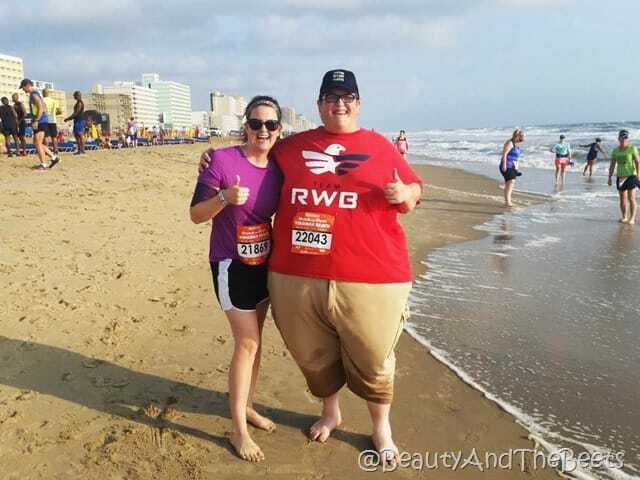 Last March the 570-lb Derek decided to cut out soda, eat healthier and commit to a 5K a month for the rest of the year. Virginia Beach is (and was) his now 14th race of the year. 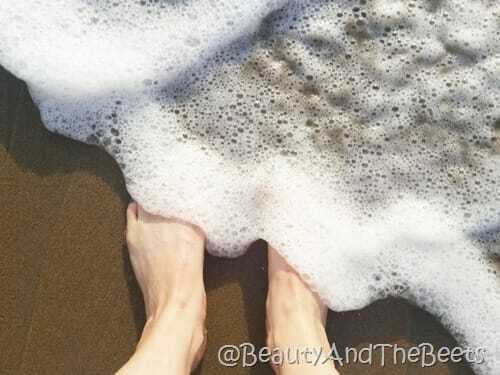 When I ran into him on the beach, he was dipping his toes into the water as well while telling me this was his first time seeing the Atlantic Ocean. (His hometown is Kansas City, MO). How inspiring is he? As we lined up for the start of the race I was not nervous, I mean it’s only a mile, right? 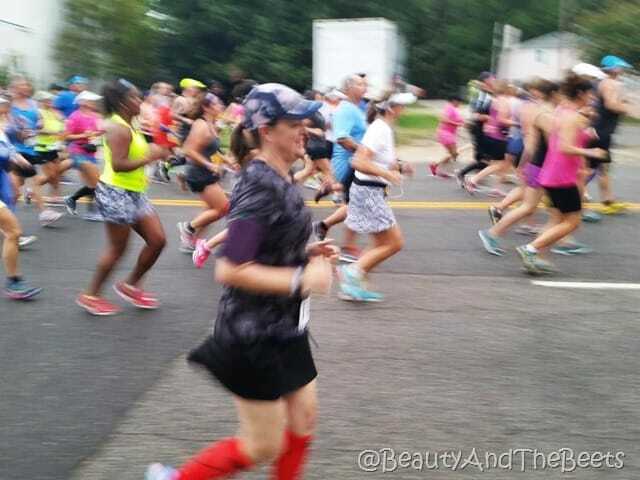 By about twenty feet into the race I was gasping for air, my legs were burning and I didn’t think I was going to make another step. 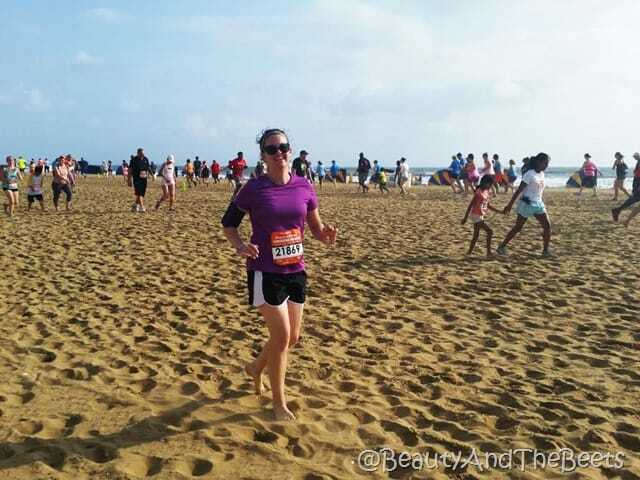 Running in the sand is really really hard! The course was not on the hard packed sand down by the water, the sand we ran on was the soft mushy sand up by the boardwalk. While I completed my mile in just over 15 minutes, it felt like 2 hours. Wow! I will never take sand running for granted again. 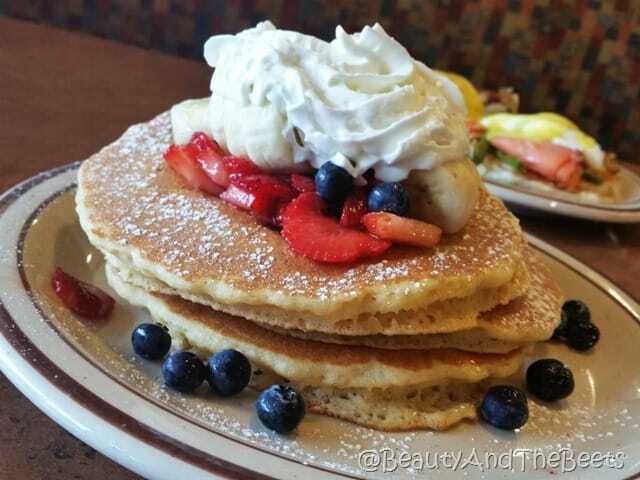 Well after that grueling experience it was time for breakfast. 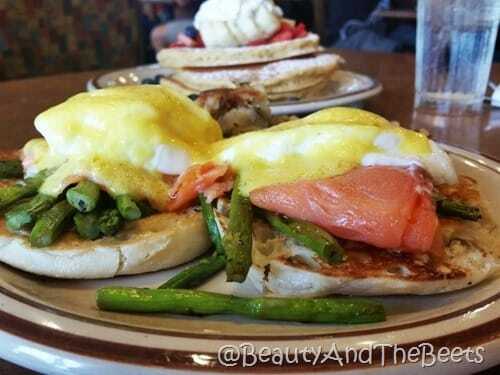 I found a cute little spot just down the street from my hotel where myself and my companion noshed (I just love the word noshed) on Berry-Delicious Pancakes and Norwegian Salmon Eggs Benedict. 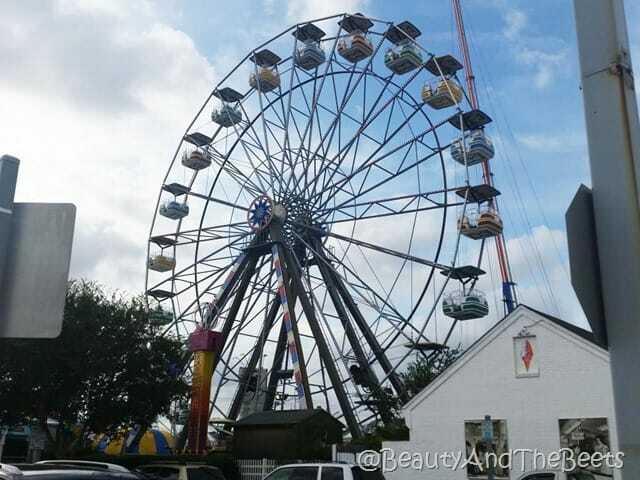 Virginia Beach is an eclectic town filled with touristy beach shops, fun houses, pizza parlors, seafood restaurants and ice cream shops. A fun place for your beach week summer vacation. 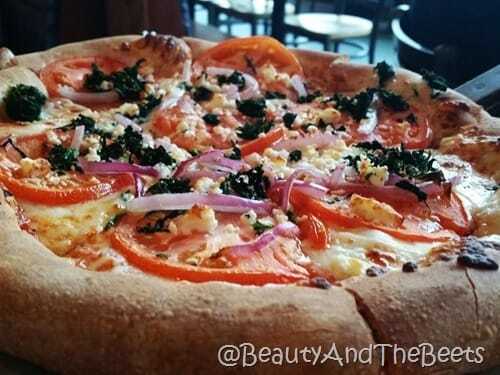 That evening I stopped for veggie pizza before turning in early for my run on Sunday. While Sunday morning arrived super early, I was completely impressed with the organization of the event. I was able to catch a shuttle bus from just outside of my hotel to the start of the race. 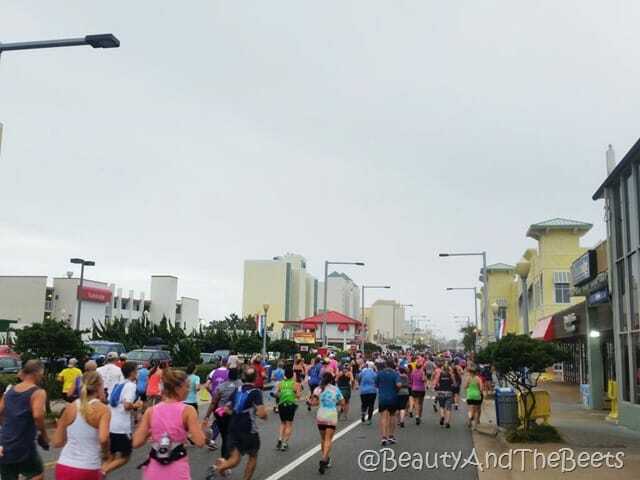 Thousands of runners stood in front of the VA Beach Convention Center, ready to race. The theme of the race was #RockYourHealth and it was inspiring to see so many people doing just that so early on a Sunday morning. There were a few passing rain showers as we were preparing to start but lucky for us the skies cleared up, leaving us with beautiful racing weather. As the race began, I was running along with all my fellow rock-n-rollers and I was incredibly grateful to be wearing actual running shoes running on actual pavement. What I love most about the Rock ‘N’ Roll marathon races are not only the cheering spectators but the dozens of bands that entertain the runners along the race route. The half marathon and the 5K runners followed the same route until about mile 2.5 where we split. We raced through the city streets, down Atlantic Ave before making a turn onto the boardwalk for the last half mile of the 5K. 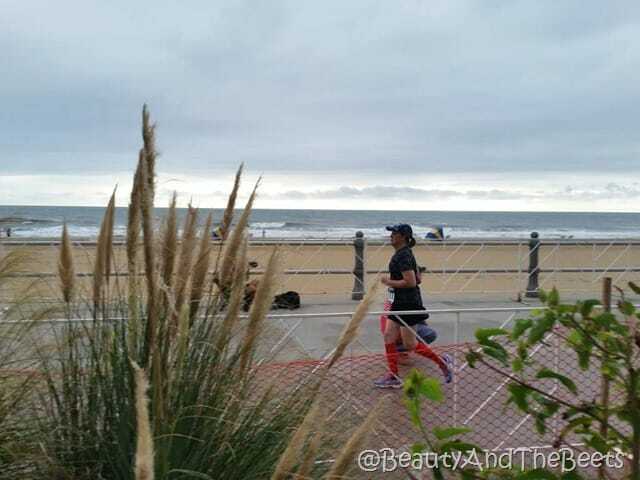 I ran like there was no tomorrow- taking in the scenery, taking in the awesomeness of running at the beach. While I thought I ran very well, I did not set a personal record for myself. 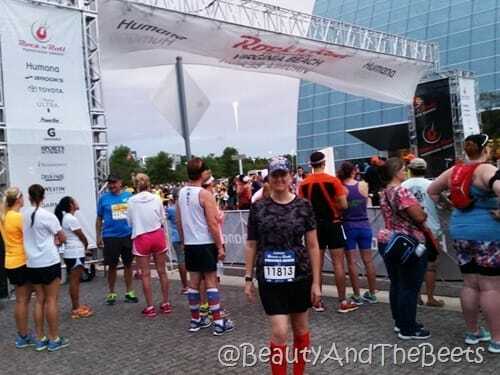 However, it was my first race post-surgery so I guess I should be grateful I finished, yes? The event itself is so inspiring. Running to the end only to be greeted by hundreds of cheering fans, how inspiring is that? 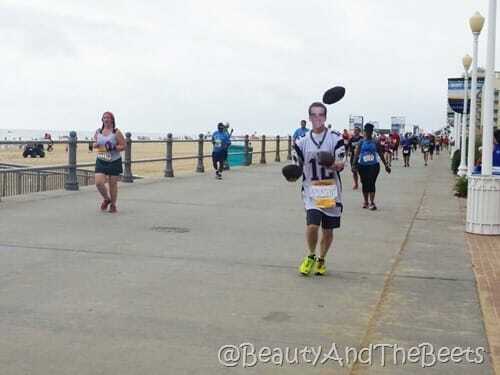 And some of the people that run these races- this guy ran the entire half marathon juggling three half-inflated footballs while donning a Tom Brady mask. I had a plane to catch back to Florida later that afternoon so I decided to end my Labor Day weekend welcoming the fall season in my own way. A stop at an ice cream shop for a pumpkin cinnamon shake. 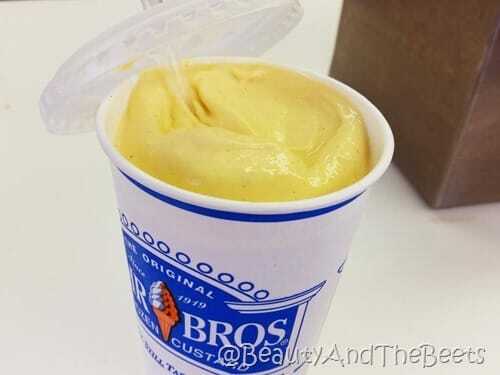 I deserved a shake, right? I love running in these type of organized events. There is something so inspiring and challenging about running with hundreds, sometimes thousands of other people, all of us with one common goal- improving our health one step at a time. 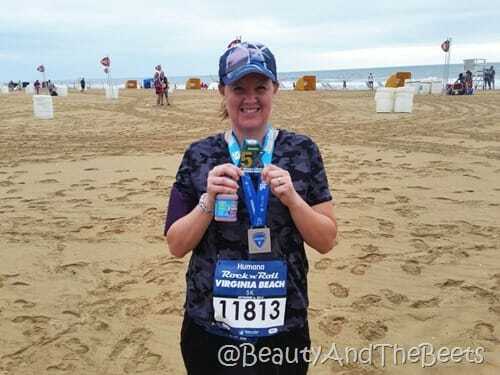 Virginia Beach was only the start of the season for me on my way to #rockyourhealth and I have committed to half marathons in St. Louis, Savannah and San Antonio. And now that Humana is the title sponsor in San Antonio I am looking forward to that event even more, if that’s possible! As I return home it’s back to running on the treadmill, trying more yoga classes and eating well until my next racing adventure! 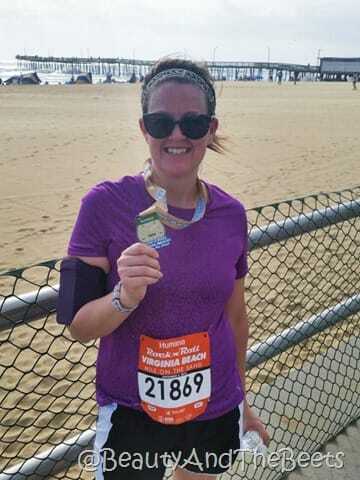 And while Virginia Beach was an amazing experience, I particularly enjoyed and appreciated the support I got from Humana. They were cheering me on every step of the way with tweets and inspirational messages. The marathon races are only one of the many ways that Humana is rocking my health. Humana is looking to improve the health of the communities they serve by 20% before the year 2020. I think a party at the beach is a great start, don’t you agree? For more information on the Rock’n’Roll Marathon series visit RunRocknRoll.com or follow @RunRockandRun on Twitter. And if you decide to sign up for a race- use the code BEETSRUN2015 for a discount to either a half or full marathon. Rock on! Fantastic blog and what a great sponsor, Humana. By the way, that’s inspiring that you can run and then eat pizza, shakes, pancakes, etc. 🙂 GREAT JOB!!!!!!!!!!!!!!!!!! Ah, well we don’t eat that way all the time- but we were kind of on vacation. Glad you had a great start to your running season. You didn’t say but I’m assuming your foot was ok for this first event. Running in the sand would really give it a workout. I don’t think I would be as brave. Good luck with your training. My foot did get a nice workout in the sand- but so did the rest of me! Yes it was! Let’s go again!